Speaking of muffins, I have been transitioning into a gluten-free diet after some stomach woes and a trip to the doctor. Rice, almond, and coconut flour for me until further notice. It’s too early to judge the changes, and I am probably only at 85% gluten-free right now. We shall see! Next week we are going back to Vinton for training and in my spare time I am going to perfect the perfect gluten-free bread recipe. 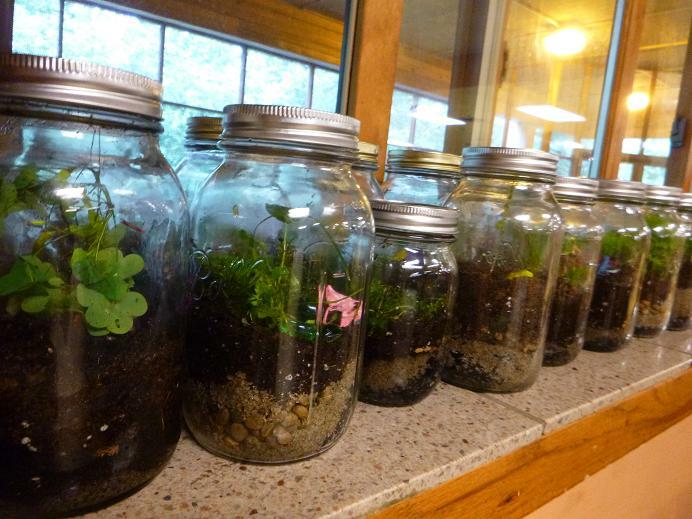 I got to run a terrarium making workshop with three sessions of campers. We went outside and found plants to use and placed them in mason jars. I think they turned out pretty decent considering the age range and the time frame. When my work day ends, it is early enough to simply lie in the sun, or borrow a bike and ride down to the lake to swim. Recently, I rode over to the lake with my teammates and we got the van stuck in the sand. There was a call of arms and it took about seven people pushing with all of our might to get it out. The swim was worth it. If you look closely, there's fisher price tiny yellow chairs on the floating dock, haha. Well, this update is quite brief, but I figured to update this dang thing when I actually have the time, energy, and computer resources. Hope everyone is doing well...I am missing Philly a bit lately!